I recently moved up to the AppImage of 2.10.8. Clicking on an ARW (Sony raw) file no longer brings up Nufraw as it did in earlier releases of 2.10. Is this the appimage from aferrero2707 GIMP_AppImage-release-2.10.8-withplugins-x86_64.AppImage ? Just been checking it out and I do not think you will get nufaw working in that. Tried it and no-show. The Gimp developers cannot see much past Rawtherapee and Darktable. The appimage will support Carmelo's own application Photoflow (I dislike that as much as Darktable) You could try that or one of the other two. I keep my old homemade appimage around for nufraw and gutenprint because it works. Do not need cutting edge for that. So that is one solution, keep your old appimage for when needed. I have lots of appimages for all sorts of things. I store them no where near the system files or my home partition. Run them when required. Photoflow is probably the closest to nufraw, if you can find a package for your version of linux. You guessed right about the AppImage I have. I am on Debian and shall see if the Photoflow you pointed to is any good for me. If it is not, I shall still have the option of using UFRaw (stand-alone). 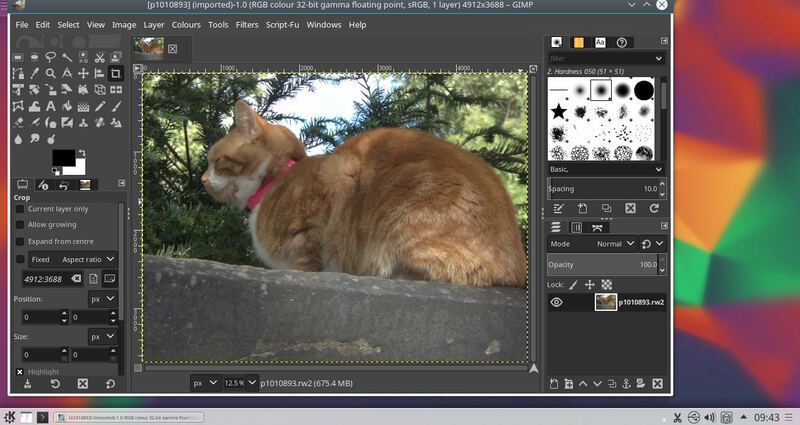 Photoflow is described as "a fully non-destructive photo retouching program" with raw conversion tacked on. I think I shall skip it and go with what I already have. Each of these runs, but I'd like RT to start when a raw file is opened by GIMP. Can this be achieved by doing something in ~/.config/GIMP-Appimage/2.10/plug-ins? Quote: Each of these runs, but I'd like RT to start when a raw file is opened by GIMP. Can this be achieved by doing something in ~/.config/GIMP-Appimage/2.10/plug-ins? You are not going to get the Gimp appimage to call-up the RawTherapee appimage. Try installing the Rawtherapee debian package. The best you will get is the same as UFraw/nufraw standalone and set the path to the Gimp appimage in the Rawtherapee preferences as 'path to external editor'. Even then a bit flakey, best have Gimp open, then open Rawtharapee, choose the image, then send to 'editor'. Any advantage over UFraw? You will get the image into Gimp as 16 bit. Quote: ..Photoflow is described as "a fully non-destructive photo retouching program" with raw conversion tacked on. I think I shall skip it and go with what I already have. Might be described as that, but Rawtherapee is even more. There are users who do everything in Rawtherapee and never go near Gimp. For what you want using the appimage, you should try PhotoFlow. Thank you. I shall try the options you suggest. In the end I took the easy route and re-installed an earlier version which includes Nufraw. You had sent me the URL in May. 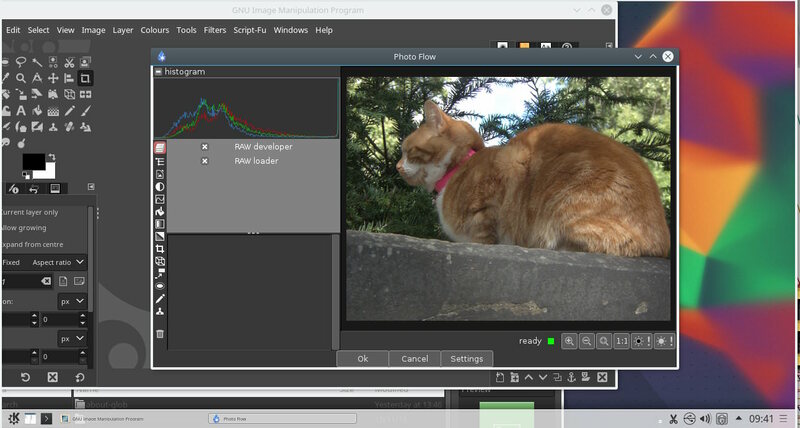 I'm the GIMP appimage maintainer and PhotoFlow developer. * running the RT AppImage from within the GIMP appimage: yes, it is possible, but the RT appimage should be renamed (or linked to) "rawtherapee" and this "fake" RT executable needs to be in a folder that is included in your PATH variable. Then it should work... or at least it did in my tests. I am now on the latest version of Debian Buster/testing and have installed GIMP 2.10.8 from a repository. Sony raw files are not opened by gimp-ufraw from the same repository. UFRaw stand-alone, also from the same repository, produces TIFF files which too give trouble with GIMP. I see only these two options: batch convert with dcraw or go back to the appImage of GIMP 2.10.5. Unless, that is, aferrero1975 tells me of a better course.